John, Paul, George and Ringo first took to the stage of the famous Mathew Street venue during a lunchtime session on Tuesday February 9 1961. 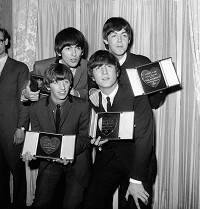 Over the following two years they made a total of 292 appearances until their final performance on August 3 1963 - as Beatlemania took off around the world. The original Cavern was demolished in the 1970s to make way for a shopping centre but a replica club stands nearby which will be the focus of tomorrow's events. Cavern City Tours, the owner of the current venue, has organised a day of tribute events and Liverpool City Council will be unveiling a major revamp of Mathew Street. The plans include a new memorial in the form of a ceiling of light, dubbed Lucy In The Sky With Diamonds, to be installed running the full length of the street. Improvements will also be carried out to the John Lennon statue and Arthur Dooley's sculpture Four Lads Who Shook The World. Other stars associated with the Cavern Club include Cilla Black, who was a cloakroom attendant when she was discovered by Brian Epstein, Billy J Kramer, Gerry and the Pacemakers, the Undertakers and the Searchers.